We have been toying with what languages my oldest should study for high school. I think he should probably do his minimum required two years in Spanish but I would also like him to do something more exciting. 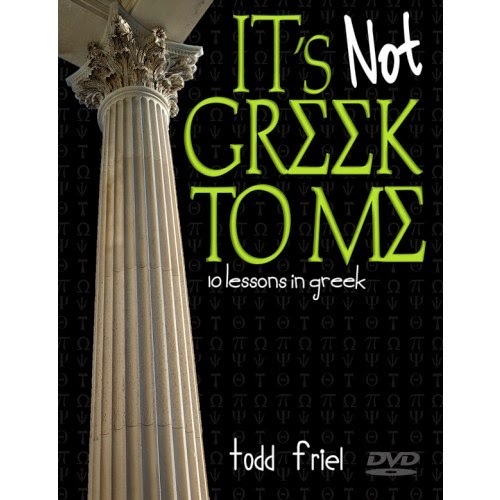 It's Not Greek to Me ended up being on the list of Moms of Masterbooks' review list, I thought this might be something. See my oldest has studied his bible and he knows a little about the translations from Koine Greek. I knew he would be intrigued! So far my oldest (13) and my middle (12) sat down and watched the first 3 sections of this DVD. We were planning on just watching through for review purposes but the kid's decided they wanted to go back and work through the DVD. In the first lesson you meet your teacher Todd Friel. He is energetic and engaging. He had us all laughing at his antics. He is what makes this DVD so engaging and I'm sure this is why my kid's want to learn more. During this lesson he explains what he will be teaching. This isn't a memorization course (although you will need to learn a few things like the Greek alphabet). The second lesson introduces the Greek Alphabet. You probably know a few letters: Alpha, Beta, omega ... We had a blast trying to sing along with Friel. This was when we realized we would like to take the time to really learn the alphabet and decided to just scan the next lesson but return to lesson 2 for further study. A basic Greek primer to help you study your Bible more deeply and know God better in the process! God chose the perfect time to fulfill His promise of the coming Messiah. This was a time when the Greek language was thriving, and it became the perfect vehicle to spread the gospel. Now you can explore the Biblical text in Koine Greek (or the common Greek of Jesus' time) with this easy and fun-to-do, 10-lesson study! Go beyond the basics to comprehend the meaning of the original Biblical texts. We really did have a fun time exploring this DVD. I get excited when my boys get excited about learning and that is exactly what happened when we watched. We happened to be driving past a local college and I was able to point out the Greek letters on the fraternity houses. It was cool because we actually recognized several and could tell the names out loud of what they said! You can purchase It's Not Greek to Me at nlpg.com for $15.99. I personally bought the Parent Lesson Planner which is for grades 7th-12th and counts as a 1/2 credit of language studies when done with the DVD. Don't forget to join us for the Masterbooks Moms Facebook party - tonight- June 24th at 7pm CST. We will discuss the DVD and there will be prizes given out!